If you choose to expand or locate your business in Brookfield your property tax liability could be deferred. That gives you cash you can use early for new investments in your project and the time to pay back later when your project is producing. Here are the facts. Brookfield’s Investment Incentive Program starts for investments as low as $100,000 and can also be used for updating and retrofitting investments, too. Brookfield continues to invest heavily in the infrastructure needed to support the business and community growth we envision. And a multi-year program to maintain our already good roads. The combined effect of these investments provides new options along the central and northern sections of Route 202 (Federal Road). 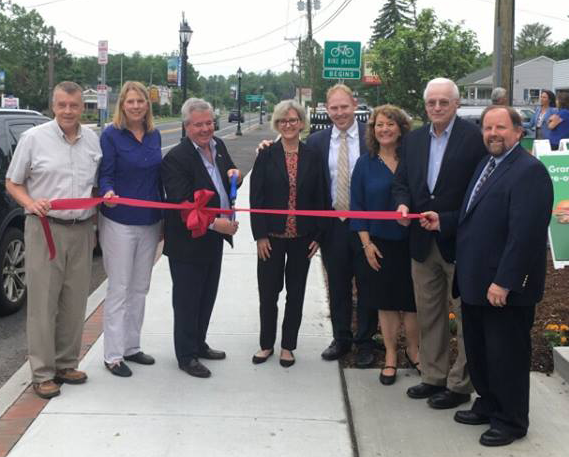 On the northern section of Route 202, called Four Corners, substantial redevelopment of a rezoned area is creating an exciting new Town Center. Brookfield businesses, large or small, are one of the many attributes that make Brookfield a great place to live, work, raise a family, retire, and yes, operate a business! And as strong as our current business community is, there is great opportunity for business growth and success. Resources lists agencies and business links to help your business with special financing, training expense reimbursement, brownfield redevelopment and other incentive programs to help get you started. Are you considering this area for your business? Are you already here and considering reinvestment and growth? Call Betsy Paynter, Economic & Community Development Manager, to learn more. We appreciate the opportunity to give you a tour of our great town!